Dimensions 1.50 by 8 by 5.50 in. Hailed as ÃÂthe guide to capitalism,Ã¢ÂÂ the New York Times bestseller Wealth and Poverty by George F. Gilder is one of the most famous economic books of all time and has sold more than one million copies since its first release. In this influential classic, Gilder explains and makes the case for supply-side economics, proves the moral superiority of free-market capitalism, and shows why supply-side economics are more effective at decreasing poverty than government-regulated markets. 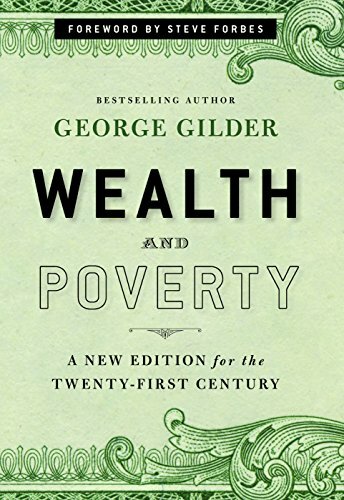 Now, in this new and completely updated edition of Wealth and Poverty, Gilder compares AmericaÃ¢ÂÂs current economic challenges with her past economic problemsÃÂparticularly those of the late 1970sÃÂand explains why ObamaÃ¢ÂÂs big-government, redistributive policies are doing more harm than good for the poor. Making the case that supply-side economics and free market policies areÃÂand always will beÃÂthe answer to decreasing AmericaÃ¢ÂÂs poverty rate and increasing her prosperity, Wealth & Poverty offers solutions to AmericaÃ¢ÂÂs current economic problems and hope to those who fear that our best days are behind us. About: Hailed as Âthe guide to capitalism,â the New York Times bestseller Wealth and Poverty by George F.